I’m a new mom. I’m also a dog trainer. This has sincerely caused me to call into question much of the advice I’ve read regarding dogs and babies. Don’t get me wrong, the majority of it is priceless and extraordinarily helpful…but the rest of it is just completely unrealistic. The fact that I have a spare half hour to sit and write this blog post is nothing short of a miracle. If you want the God’s honest truth, I had to choose between this or a shower. Lucky blog, you win this round. It’s an absolute non-negotiable that I walk my dogs every day. From what I’ve seen so far, the hour’s worth of exercise really and truly (not just in theory anymore) does determine how well they deal with the daily stresses of a new baby. It also helps me maintain my sanity. With that in mind, I now realize how scant the amount of advice is about trying to walk with two dogs and a stroller. Let me be the first to say that it’s not easy. The optimism with which I leave the house every day quickly unravels into a frazzled mess of poop bags, tangled leashes, and crying baby. Not so good. Fortunately the problem-solving side of me has quickly developed some handy tricks that have taken a REALLY difficult stroll into a manageable, and even sometimes enjoyable one! There are times for training and times for just surviving. If your dog is a puller, now is definitely not the time to train him to walk nicely. In a perfect world, we’d start working our butts off on loose-leash walking the second we find out we’re pregnant (or how about during puppy-hood?) Since most of us assume it’ll “all work out”, by the time we get to this point it’s too late. Mercifully, there are tools that make it a LOT harder for your dog to pull on leash. Try a no-pull front harness such as the Freedom Harness, or the Sense-ible harness. You will thank me I promise. 2. Make Sure Your Leash Is the Right Length. Nothing makes you want to cry like a leash that has wrapped itself three times around the wheel of your stroller. I learned this one the hard way. Avoid leashes that are too long; especially extendable ones. Not only is it dangerous, but it adds to an already limited amount of control. In my experience a four foot leash is more than adequate. 3. Don’t Clip, Tie, or Fasten the Leash to the Stroller Itself. As I was out walking with a friend, she helpfully suggested, “Why don’t you just buy one of those mommy clips [a giant Caribener] and attach the leashes to the stroller?” I really had to think about this one because, believe me, it’s so tempting to have one less thing to hold on to. However, if your dogs are anything like mine, there is a serious danger of the stroller being pulled over. With each passing car, cyclist, and dog, I run the risk of having a toppled baby…not a good idea. Put the leash over your wrist instead, and hold onto the stroller with your hands. 4. Walk the Dogs on the “Polite” Side. Now this was something I hadn’t at all considered. When I’m walking down the sidewalk with both my stroller and my dogs I take up a LOT of space. While I would usually heel my dogs to get them in close to me as we pass people on the sidewalk, it’s very difficult to do that with a stroller, and it can be downright scary for a dog. I’ve decided that it’s much easier to walk my dogs on the side that’s closest to the grass. The stroller becomes a handy visual barrier for my reactive dog and we can stick close to the inside of the sidewalk in order to make plenty of room for passing strangers. Voila! It can be a tad awkward because you’ll have to keep switching sides, but it’s worth the extra effort. 5. Teach a “Wait” at an Open Front Door. 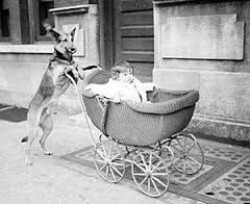 Have ever thought about the actual logistics of getting the baby, the stroller, and the dogs outside? Which order do you bring them out in? First you have to set up the stroller, then you have to put the baby in the stroller, then you have to get your dogs. This presents a problem, because you can’t go back into the house and leave the baby outside while you get the dogs. If you have nowhere to tie your dog outside while you get the baby inside, then it would be a FABULOUS idea to train your dog to wait at the front door until you’re ready for him to join the party. That means you leash him up before you even get the stroller and the baby ready. I wish I had taken the time to work on this one. For those of you that still have the time, take advantage!